Associate Professor Greg Finstad is seeking students who understand Alaska's tundra ecosystem and want to become range managers. 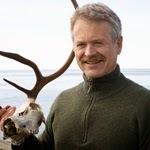 Finstad, manager of the Reindeer Research Program, is exploring options for a partnership with California Polytechnic Institute. He discussed the idea at a Range Science Education Council meeting last winter. "We can work across institutions to build strong range science programs," Finstad said. He envisions a two plus two program, where students would study their first two years at the University of Alaska Fairbanks and finish the last two at Cal Poly. Ideally, Alaska students would be able to pay in-state tuition in California. "Cal Poly has its own slaughter plant for beef, swine and cattle," Finstad said. "Their motto is to learn by doing." A precedent for the UAF/Cal Poly ties has already been set with the Reindeer Research Program having hosted six Cal Poly interns over the past few years. These Bureau of Land Management-funded positions have met with success on behalf of both institutions. "There is a lot of rangeland in Alaska that needs good range scientists and range management," Finstad said. He hopes to work with Cal Poly's Mark Horney, assistant professor of rangeland resource management, to work out the details of the degree. "We could make a really nice package," Finstad said. "The students would come out really well qualified." The need for land managers is nearing urgency, as much of the agency work force in the field is nearing retirement age. "I just need a couple of students to teach the traditional range management principles," Finstad said. "We want to develop a program to train future range scientists for Alaska."